More infrastructure spending on the horizon? Quick—check your phone to see if you have a gravel app on it. Do you subscribe to any concrete- or asphalt-specific podcasts? That’s the thing about an industry like raw materials: It generally isn’t going to crank out trendy products or services that create media buzz. Which is probably why more people are still talking about the Lyft IPO than they are about construction materials stocks. Even though the S&P materials sector has been uninspiring so far this year, trailing the S&P 500’s (SPX) return by about a percentage point, the construction materials sub-sector has been rolling, with a 21% year-to-date return that has put it on par with information technology. 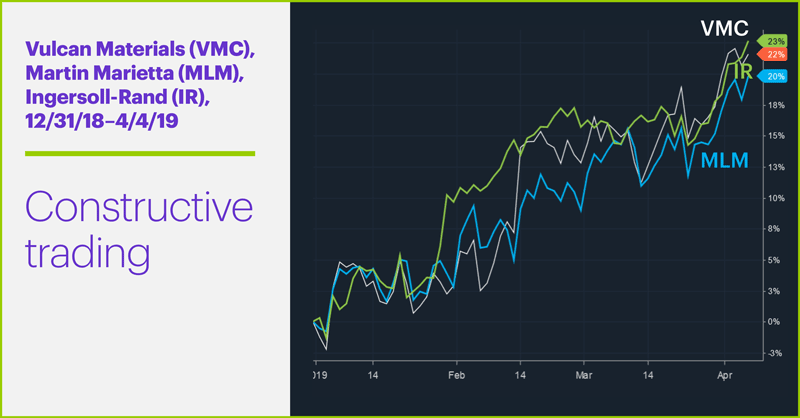 With the US housing market still trying to gain traction (although homebuilding stocks have mostly been holding their own so far this year), it may seem a little unusual that VMC, MLM, and IR are enjoying such a solid start to 2019. But there’s a lot more to construction materials than residential building. ●The report confirmed the single-family housing market was still slack. ●Public construction spending, however, was up significantly. Big spending on highways and streets translates into a lot of gravel, concrete, and asphalt. Which brings us back to VMC and MLM. 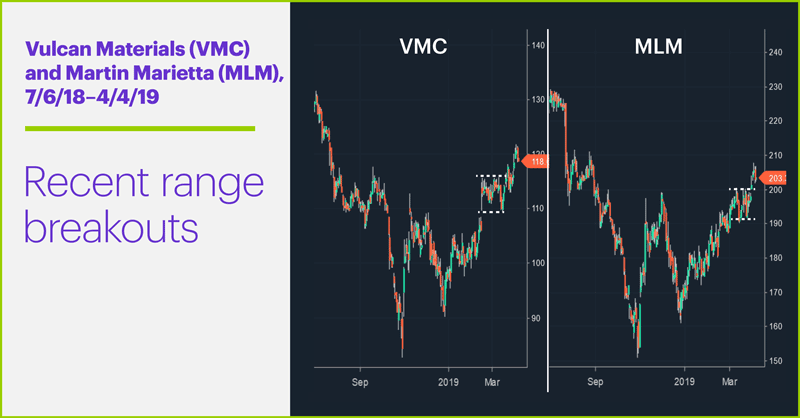 The chart above shows both stocks recently broke out of short-term consolidations to make multi-month highs—a bullish sign to many technicians. If construction spending continues its recent trend, construction materials stocks like these may continue to be attractive plays for long-side traders, especially those who wait to buy them on pullbacks rather than chase them at highs. Market Mover Update: After Wednesday afternoon’s rally-and-reverse head fake, Facebook (FB) gained more than 1% yesterday, and again pushed above the breakout level noted in “Breakout watch: Stocks on the brink.” Meanwhile, ConocoPhillips (COP) continued to decline, falling below $65. And speaking of markets at potential tipping points, June gold futures (GCM9) dropped to an important support level yesterday, falling to their lowest level since late December (around $1,285/ounce) before rallying $11 to get back into the green on the day. Sherwin Williams (SHW) added a third day of gains since breaking out of its consolidation (see “The power of pricing”). Today’s numbers (all times ET): Employment Report (8:30 a.m.), Baker-Hughes Rig Count (1 p.m.) Consumer Credit (3 p.m.). Today’s earnings include: Greenbrier (GBX), Lovesac (LOVE). 1 Econoday. Construction Spending Report. 4/1/19. 2 ForConstructionPros.com. Report: U.S. Infrastructure Spending Outlook Brightens. 1/29/19. With a little more than two weeks until expiration, someone makes a big options bet in a stock testing highs.